Get natural looking, shiny nails right at home! 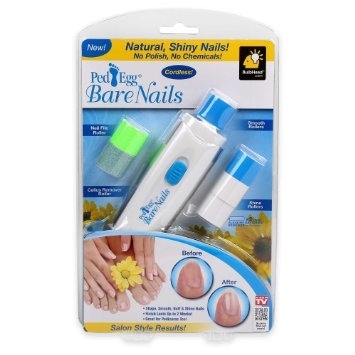 Ped Egg Bare Nails, As Seen on TV, files, buffs, and shines your nails in seconds. Reveal the natural beauty of your nails with Bare Nails battery-powered automatic nail polisher without the cost of expensive manicures and pedicures at the nail salon. Get natural, salon quality nails right from your own home. Ped Egg Bare Nails is simple and easy to use- the Nail File Roller is used to shape your nails, the Smooth Roller to smooth bumps and ridges, followed by the Shine Roller for a natural shine that lasts up to 2 weeks. No nail polish needed, Bare Nails leaves your naked nails looking healthy and perfectly polished. Ped Egg Bare Nails battery operated nail polisher is perfect for manicures and pedicures! Includes- 1 Bare Nails Polisher with cap, 2 Smooth Rollers, 2 Shine Rollers, 1 Nail File Roller, 1 Callus Remover Roller. Requires 2 AA batteries (not includes). I really like mine. I've had it for a while. It works exactly as they say it does and makes my nails look great. While I can fine refills for most of the rollers, I cannot find any refills for the callus remover roller. Anyone know where I can get them? Thanks.